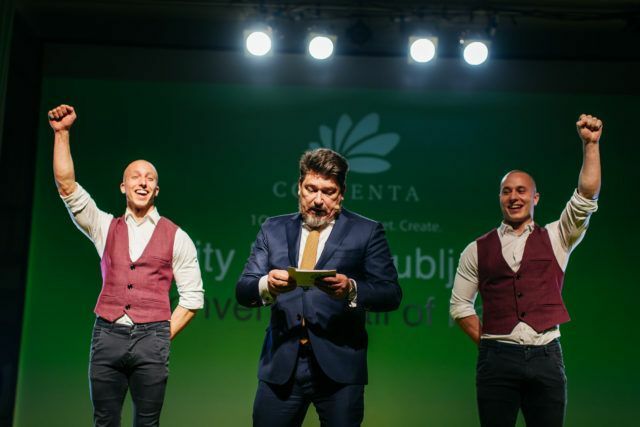 Conventa is a leading, new European trade show for meetings, events and incentive travel which, for the eleventh consecutive year, will take place in January, in Ljubljana, Slovenia. Conventa has become the leading marketplace for the meeting industry of New Europe and the trade show that facilitates personal contacts between an international hosted buyer community and the wide choice of meetings supplier businesses from New Europe. The core of Conventa remains a professional platform for creating business opportunities and exchanging expertise in a relaxed atmosphere, complemented with unforgettable happenings. It’s all about quality not quantity. Although the number of hosted buyers is pretty much the same year after year, each time you participate, 80 % of hosted buyers are new and they are all cherry-picked by us. No time wasted searching for potential clients. For the organization of a sales meeting you will spend on average at least 60 minutes. At Conventa on average exhibitor pre-schedules 25 appointments but conducts more than 30 meetings in total (in 2018, they held a record average number of 33 meetings). This would mean each exhibitor saves 29 hours of organizational time, not to mention the time saved for planning the business trips, travel and actual meeting. Conventa marketing channels can be used to your advantage 365-days a year. The sooner you register, the more marketing you will get. Remember, Conventa has a large data base of 70,000 meetings professionals. The show continuously communicates with its target audience and uses numerous marketing channels to do so. Personal touch and the friendliest show in the New European region. Great hospitality is what warms up even the coldest hearts that is why Conventa is a place where your coffee cup never runs dry. In 2018, on a scale from 1 to 5, Conventa exhibitors rated the friendliness and effectiveness of the show organizer with 4,53. Socializing together means making business together. Conventa is the only trade show that organizes joint social events making sure exhibitors and hosted buyers can network every step of the way. There is no stress, just a friendly and productive atmosphere ideal for a relaxed matchmaking experience. Let us just mention that on average exhibitors conducted 6 meetings during Conventa 2018 social events. Knowledge makes the world go round. Knowledge was, is and always will be crucial in our industry. Conventa is fully aware of that. Every year the show introduces top knowledge modules for the regional industry that are complimentary. We will learn together also in 2019. It’s all about verified satisfaction. In 2018 more than 30 % of exhibitors said the quality of services exceeded the price of participation. A whopping 92 % of exhibitors think investment in exhibiting at Conventa will pay off completely or at least partly. When others say it’s worth to exhibit then it must be true. A record 96% of exhibitors confirmed that they would attend Conventa again, whilst nearly all (99.8%) would also recommend it to their colleagues. We deliver, what we promise. By now we have proven that we deliver what we promise and we promise to make your time worthwhile also in 2019. Contact us by mail at natalija@conventa.info or by phone at +386 1 430 51 03. We would be happy to help. We look forward to creating another amazing Conventa experience together!